For Melody Xie, a Chinese dance, culture, and language instructor, Northwest Folklife Festival presents an opportunity to educate the public about different Asian cultures. Xie is the coordinator for “Journey Through Asia,” a Folklife Festival showcase that celebrates different Asian cultures through dance and performance. Xie is the first person of Chinese descent to take on this role at the Festival in the past 48 years. “Journey Through Asia” will feature 100 performers and will include dancers from Xie’s own dance group, the Melody Institute. The showcase will also feature dancers from other local Asian performance groups, such as Huong Viet Performing Arts Group, Minyou Japanese Folk Dance, and Siam Smile Dance. There will be 33 performances at the showcase. Xie created the Melody Institute in response to her work with Families with Children from China (FCC), an organization that provides support to families with adopted children from China. Twenty years ago, when Xie first came to the United States, she performed for a Chinese New Year show hosted by the FCC and admired the families she met through the organization. At the time, Xie worked at the Lakeside School, a private school in Seattle where she launched a Chinese language program. Due to her work in education, the FCC parents encouraged Xie to start her own school that would enrich the lives of adopted Chinese children. Xie founded the Melody Institute in 2005 as a result. At the Melody Institute, Xie teaches Chinese dance — everything from folk to modern to traditional. Her dance classes focus on style, music, and costumes. Although she primarily instructs children and teens, Xie also provides dance exercise classes for adults. Her students range from 2 to 60 years old. Xie also teaches Chinese language classes, though she notes that for younger students, it is important to breed an interest in the culture first, before engaging them in learning the language itself. 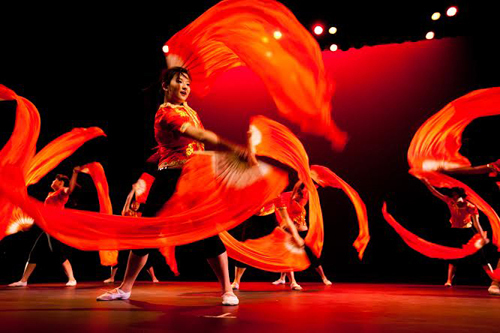 Around 70 of Xie’s students will perform at Folklife Festival this year. Her students have long performed at the event and, because of her longstanding relationship with the Folklife Festival, the board offered her this year’s coordinator role for the Asian culture showcase. Xie decided to refine the showcase’s goals this year. Previously, the show was known simply as the “Asia Show,” and each group routinely performed in front of an audience with little explanation between acts. This year, Xie restructured the show to focus more on education. “I want to create a real journey for viewers — one where it feels like they’re moving from culture to culture, from East to West,” said Xie. This year, there will be an emcee running the showcase that will act like a tour guide between performances. The emcee will introduce the audience to each performance, and inform them with relevant cultural facts. “The audience will have a chance to learn something from our show,” said Xie. She hopes to thank the audience in the finale by distributing small gifts to viewers whose birthdays fall in May or June. The purpose of these gifts is to reward and celebrate people for watching the showcase. Xie will also get on stage during the showcase’s finale and teach spectators a few basic dance moves. The Melody Institute will perform at the Bagley Wright Theatre at Seattle Center on Saturday, May 24 from 7 p.m. to 10 p.m. The event is free. For more information, visit www.facebook.com/MelodyInstitute or www.nwfolklife.org/festival.